The Illini Invitational welcomed Stanford and a top field to famed Olympia Fields in Chicago, site of several major championships. Stanford comes into the Illini Invitational off a 15-stroke win at the SW Intercollegiate hosted by USC. The same 5 players, Maverick McNealy, Jim Liu, Viraat Badhwar, Patrick Grimes and Dominic Francks who competed recently are representing the Cardinal. The field is strong with 8 of the top 20 teams entered including #1 Alabama, #3 Stanford, #7 Illinois, #13 Texas, #18 Texas A & M and #19 Arkansas. Maverick McNealy picked up his second win in as many outings Sunday by claiming top honors at the Olympia Fields/Fighting Illini Invitational. 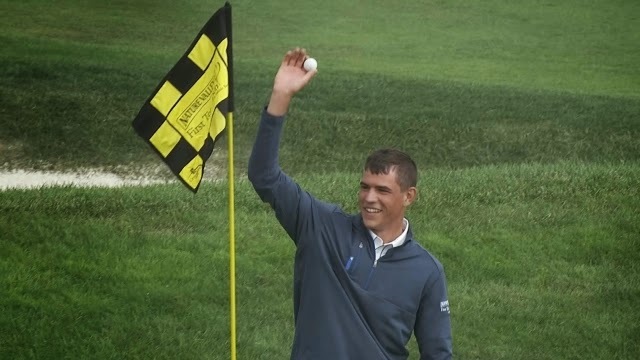 McNealy, who collected the first win of his collegiate career earlier this week at the Southwestern Intercollegiate, fired three consecutive rounds of 71 to finish 3-over at the par-70 Olympia Fields Country Club. He shared the top billing with host Illinois’ Dylan Meyer. Stanford’s Cameron Wilson also shared medalist honors at the same tournament in 2013 with Robby Shelton of Alabama. Stanford (294-299-289) was fourth overall among the 15-team field at 42-over. Illinois (+21), Florida State (+32) and Baylor (+36) claimed the top three spots. “I’m happy with how the guys hung in there, but we’ve got much to work on,” said Conrad Ray, Stanford’s Knowles Family Director of Men’s Golf. “It’s early in the year, so it was good for us to play a challenging course to see what we have team-wise. 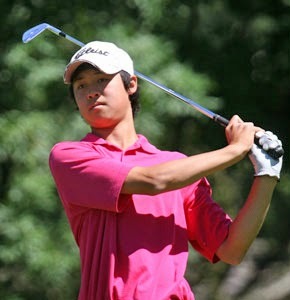 Liu’s even-par third round was the best score of any Cardinal during the 56-hole event. He was 4-under on the front but had four bogeys on the back, eventually finishing 12th overall at 8-over. Patrick Grimes (+11) squeezed into the top-20, taking 19th with rounds of 74-73-74. Viraat Badhwar (+20) tied for 54th and Dominick Francks (+31) tied for 71st. The Cardinal has a few weeks off until traveling to Forth Worth, Texas, for the Swoosh Invitational (Oct. 6-7). The 2014-15 season began at the USC Invitational at North Ranch CC in Thousand Oaks, CA. Stanford's team included 3 returning sophomores Maverick McNealy, Jim Liua and Viraat Badhwar plus junior Dominic Francks and senior Patrick Grimes. David Boote, a junior and top player from last year is in Japan representing Wales in the world amateur team championships. The final round showed impressive depth from all 5 players including a 66 by Maverick, 70 by Jim Liu, another 1-under 70 by Dominick Francks, a 71 by Patrick Grimes and a 72 by Viraat Badhwar leading to the tournament's lowest team score of 8-under par 276. And this big win was done without David Boote, a top returning junior from last year who's in Japan playing in the World Amateur championships. 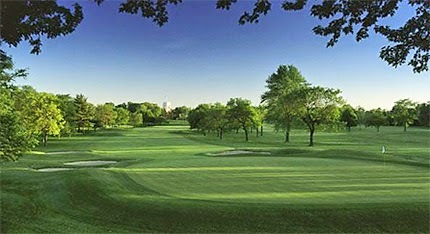 The team moves on to play at Olympia Fields in Chicago in the Illini Invitational September 12-14. WESTLAKE VILLAGE, Calif. – Stanford started the fall portion of its 2014-15 schedule right where it left off at the end of its previous regular season -- on top of the leaderboard. The Cardinal is first among the 12-team field at the Southwestern Intercollegiate, as 36 holes of the three-round event at the par-71, 6,964-yard North Ranch Country Club were contested Monday. At 4-over, Stanford (280-292) is six strokes ahead of second-place Washington (578). The Huskies fired a tournament-best 2-over in the second round of competition. Host USC (580) is third overall. Stanford, which collected six wins during the 2013-14 slate, closed its prior regular-season schedule with back-to-back wins. In fact, the Cardinal has not trailed through each of its last 14 days of stroke-play competition, a streak that originated March 28, 2014. 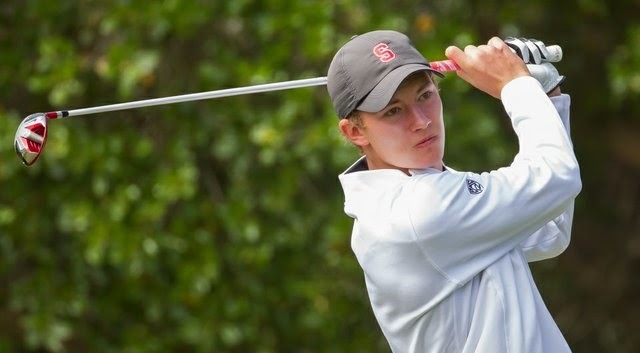 Stanford last trailed on such an occasion at the Southern Highlands Collegiate Masters (March 9), when it finished second. Maverick McNealy (66-72) and Jim Liu (69-69) are tied for first among individuals, with Viraat Badhwar (70-73) in seventh. Patrick Grimes (75-79) is tied for 54th and Dominick Francks (78-78) is tied for 58th. McNealy was 6-under on the back nine of his opening round, tacking on an eagle on the par-5 15th. The final 18 holes will be played Tuesday beginning at 8 a.m. (PT).